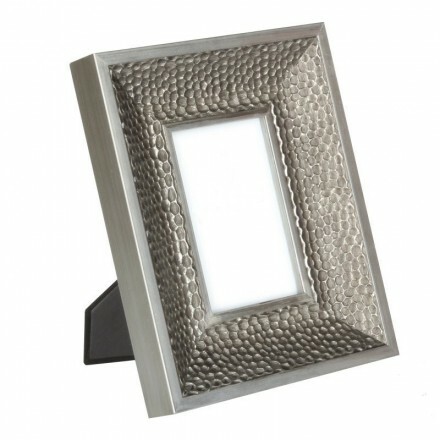 Beautiful pitted photo frame, carefully painted to look like pewter metal. This dimpled effect picture from made from wood but painted to look like pewter with a metallic finish is a beautiful frame, the dimples catch and reflect the light. Would suit contemporary or traditional setting, for portrait or landscape photos. Photo size 10 x 15cm. Has felt backing with fixings to be hung on a wall either as portrait or landscape. Comes beatifully boxed, ideal gift solution.